Used regular crimini mushrooms instead of Chinese mushrooms. Still great recipe, a staple now. Can adjust vinegar and seasoning to taste. This is one of my go to recipes. Super simple and delicious. Loved the addition of the caraway seed. Nice and easy. Made this with red pepper saute and polenta from Vegetarian Times. This works great with all beans (black-eyed peas, navy beans, etc.) but is also delicious on steamed green beans. Simple and tasty. Served, as suggested in the recipe, with pickled red onions; also served with salmon and Roasted Beet and Walnut Salad from the Nourished Kitchen Cookbook. One of my favorite salads. Simple and delicious. Everybody loves it! Surprisingly great results with such minimal effort! I made this in a generously-greased 8-inch cast iron skillet, preheated in the oven at 450 before turning it down to the prescribed temp for baking. Easy to make, and dough was great consistency but the pancakes came out really chewy, not the consistency I've had in restaurants. Maybe next time I'll let the dough rest and use the kneading/rolling into tube/snaking technique other recipes for this dish seem to use. This quiche has a delicious combination of flavors. I usually use a 10 ounce box of mushrooms rather than the amount called for. This was quite tasty. It might have been because of my crust recipe or my ceramic pie pan, but the crust got slightly soggy for me, so next time I would blind bake it for about 10 minutes before putting in the filling. 1) Heavy-duty oil the pie pan next time. Although I oiled the pan, the potato crust still stuck. 2) Next time, either add more herbs or add them after the cauliflower cooks. A good basic recipe. This is a great dish for a day in need of cheese and potatoes. Make sure the bottom of the pie or tart pan is greased or it will stick! I would imagine this to be a good "starter" dish for someone wanting to try out eating the occasional vegetarian main dish. Crust comes out too moist to be picked up. Next will try less or no cheese in the crust. Mollie's classic vegetarian dishes go modern, yet retain all their personal charm. This new revised edition is a companion volume to her TV series. 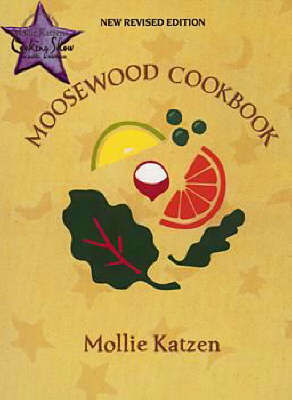 Preserves the major revisions and additions that Mollie made in 1992, and adds 5 new recipes.